It comes as no surprise that Chrome communicates a lot with Google during regular browsing sessions, and while the connection attempts serve a purpose — like checking websites you visit against a phishing and malware database — it also provides Google with information at the same time. One needs to distinguish between preferences that are controllable by the user, and those that are not. The following guide looks at user controllable preferences only. If a connection to a website cannot be made for whatever reason, Chrome may retrieve alternative web pages similar to the one you are trying to reach. To achieve that goal, the website you are trying to open is submitted to Google. Uncheck “Use a web service to help resolve navigational errors”. 2. Use a prediction service to help complete searches and URLs typed in the address bar. This feature will auto-complete addresses or searches that you start to type in Chrome’s omnibar. It will show related web searches, match addresses from your browsing history, and also from popular websites. The browser sends information about what you type to the default search engine of the browser. If that is Google, the information will be logged. 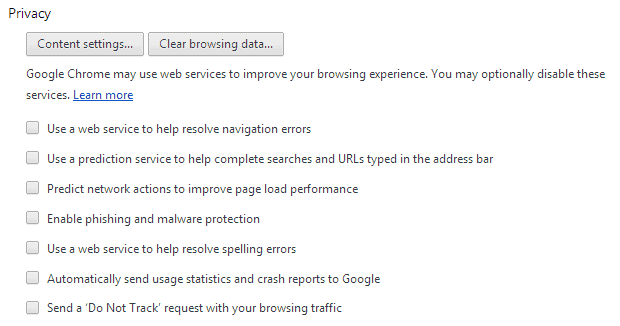 Uncheck “Use a prediction service to help complete searches and URLs typed in the address bar”. Instead of looking up the IP address of a web page on user action, Chrome will do so in advance by predicting the user’s next action. This speeds up the connection process if the prediction was correct, but may waste some bandwidth if it was not. For this to work, Chrome will analyze all links on a web page and fetch IP addresses for those that it predicts you may visit. Uncheck “Predict network actions to improve page load performance”. Websites that you open in Chrome are checked against a malware and phishing database before they are loaded. If a web page is a match, information are submitted to Google to determine whether it is a risky site. Uncheck “Enable phishing and malware protection”. If enabled, text that you type will be submitted to Google servers for spell checking purposes. Uncheck “Use a web service to help resolve spelling errors”. This will transfer information about how the browser is used and information about crashes to Google. This includes information about browser preferences, clicks, and memory usage among other things. Uncheck “Automatically send usage statistics at the bottom of the page”. Disables the sending of hyperlink audit pings which can be used to track users. Click on Disable underneath it. Switch from Google to a privacy search engine such as Startpage or DuckDuckGo. Select a different search engine and click make default. 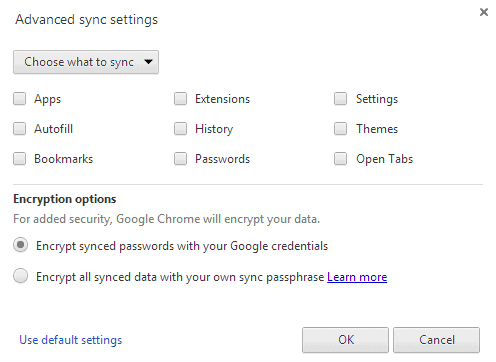 While synchronization sounds like a great idea if you are running Chrome on multiple devices, it needs to be noted that the data is stored on Google servers. You can choose to encrypt all data with a custom password that is different from your Google account password, or disable sync altogether to store no information on Google servers. Click on “Advanced sync settings”. Select “Choose what to sync at the top”. Uncheck all items that you do not want to save (all if you want). Alternatively, switch to “Encrypt all synced data with your own sync passphrase”. Type a password that you want to use. Cookies can either be set by the “domain” you are currently on, e.g. ghacks.net, or by a third party domain that is used for some functionality on the site. This is often used by advertising scripts to track users. Note: Doing so may render some services unusable. Add those domains to the list of exceptions. You can keep cookies set by the domains you connect to for as long as you do not clear them or they do not expire, or only for the session. 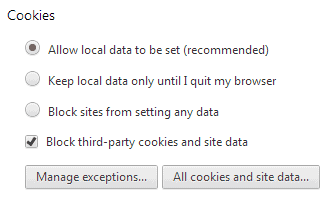 If you want that, change the setting under cookies from “allow local data to be set (recommended)” to “keep local data only until I quit my browser”. Note: This removes session cookies among others, which means that you will have to sign in to web services again as you will be logged out automatically when the cookies get deleted. Google may offer to translate a web page you are visiting if it detects that it is published in a language that is different from the default system language or a language that you have added to the browser. Uncheck “Offer to translate pages that aren’t in a language I read”. Location tracking can be useful in certain situations, as websites and services may provide you with custom information or improved data when you allow that. They can look up your location to automatically display offers near you for example. It is usually possible to enter a location manually on the other hand. Switch from “ask me when a site tries to track my physical location (recommended)” to “Do not allow any site to track my physical location”. You can add exceptions for sites that you want to allow. While you can go through all preference and options menus manually, you can instead use a browser extension such as Privacy Manager instead to handle most of these changes. If you want much of what make Google Chrome without many of the Google-only features that the company added to it, then you may want to try Chromium. While it may share some features, others may not be included. Most plugins run by default in Chrome when they get picked up by the browser, which means that websites can use what they have to offer as well without any user interference or notification. If you do not like that, change them to click to play instead so that you are always asked before plugin contents are run on websites. You can add exceptions for sites that you trust. Switch “Plug-ins” from “Run Automatically (recommended)” to “Click to play”. Note: Google will block most plugins by default come 2014. The most popular ones will be set to click to play automatically first, but eventually, all plugins won’t be available anymore in the browser. This entry was posted on Monday, November 11th, 2013 at 11:22 am	and is filed under privacy, tech tips. You can follow any responses to this entry through the RSS 2.0 feed. Both comments and pings are currently closed.